This week’s #BookFace is practically electric! 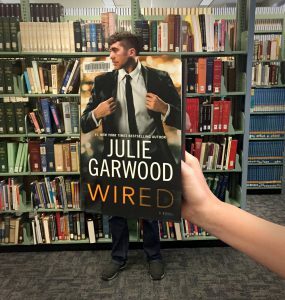 “Wired” by Julie Garwood (Berkley, 2017) is this week’s #BookFaceFriday and seemed like the perfect way to kick off the next round of our Nebraska Library Innovation Studios (LIS) project! NLC staff members will be traveling around Nebraska over the next few months, maybe even visiting your library. They will be installing makerspaces, training librarians/community members in the different types of technology, and showing them how to share it with their communities. This week’s #BookFaceFriday model is Max Wheeler, Instructional Designer on the LIS project! He may not be an FBI agent or a model/hacker but he sure knows a lot about all of the different machines in our makerspaces.